India is paying tribute to two great sportsmen. Sachin Tendulkar, 40, known as "God of Cricket," will retire after his last test match that started on Thursday. The world chess champion Vishy Anand, 43, is defending his title against Magnus Carlsen, 22, in his home city of Chennai. Anand made his task very difficult: after draws in the first four games, the Indian grandmaster blundered in two consecutive games and found himself down 2-4. While Tendulkar's retirement made it to the front pages of American newspapers, the coverage of the chess match has been so far sporadic. The 5-foot-5 Indian cricket player, also called the "Little Master," began his wonderful career in 1989 at the age of 16. He played in 200 test matches and is considered cricket's best batsman. Anand announced his arrival among the best chess players by winning the World Junior Championship in 1987 at the age of 17 and his collection of world titles is impressive and thus far unmatched. He won world championships in knockouts, tournaments and classical matches. He was also the world best in rapid and blitz play, and in advanced chess. To overcome the deficit in the last six games against the world's top-rated Carlsen will not be easy, but Anand promises to do his best. The second half of the championship starts on Monday. It can be followed on the official site and other web sites such as ChessBase or The Week in Chess. We will have a wrap up after the match. The Azerbaijani team, led by the world championship candidate Shakhriyar Mamedyarov, was the only undefeated team of the competition that finished Sunday in the Polish capital of Warsaw. They drew four and won five matches, finishing with 14 points. Three teams, France(silver medals), Russia (bronze medals) and Armenia ended with 13 points. Russia, the pre-tournament favorite and the top-rated team, surprisingly lost to Turkey and later to Armenia. France, leading throughout the event, lost to Russia in the last round. Altogether, 38 teams took part in the Open section. Ukraine won the women's section with 15 points. Russia won the silver with a better tiebreak over the Polish women, both teams ending with 14 points. We expect knights to be placed in the center of the chessboard. When they move backwards, specially to the edge of the board, something may get overlooked. Emmanuel Neiman & Yochanan Afek talk about it in their illuminating book Invisible Chess Moves, published by New In Chess. They say the backward knight moves are hardest to spot. The following three fragments could be good additions to their book. They were inspired by a game from Warsaw. The knights do the damage from a single spot - the square d8. 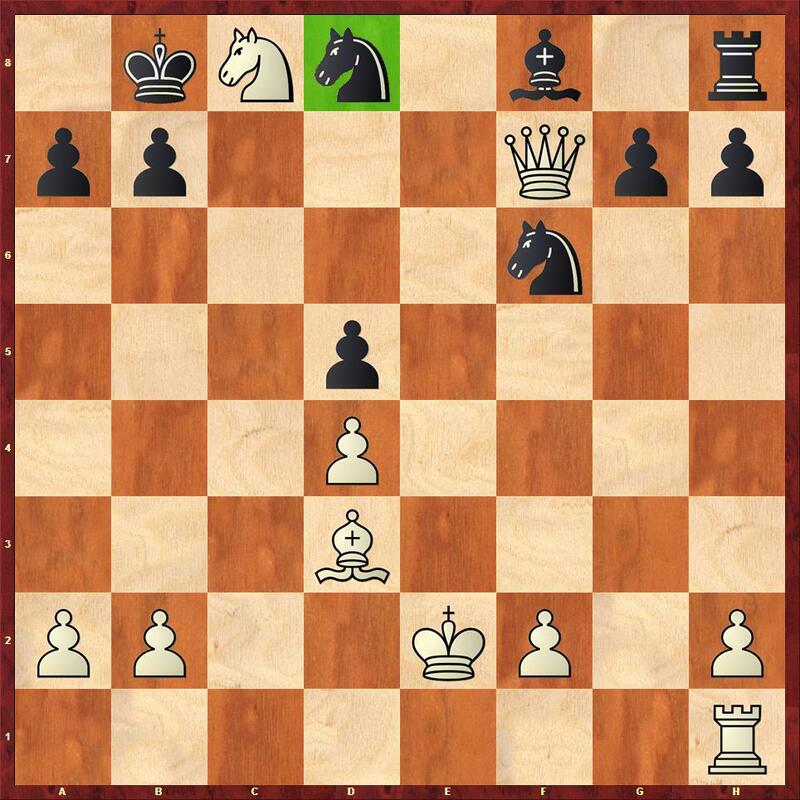 The first example is from the game between the Czech GM David Navara and the young Dutch GM Anish Giri. White could have played 27.Ne5 to give his rook some freedom. 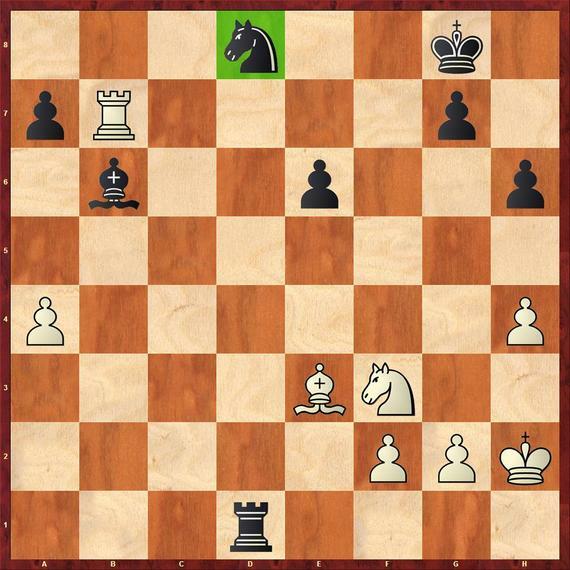 Instead, he blundered. Black attacks the white rook with a backward knight move and white has to shed the exchange. Black is an exchange up. Giri won in 59 moves. 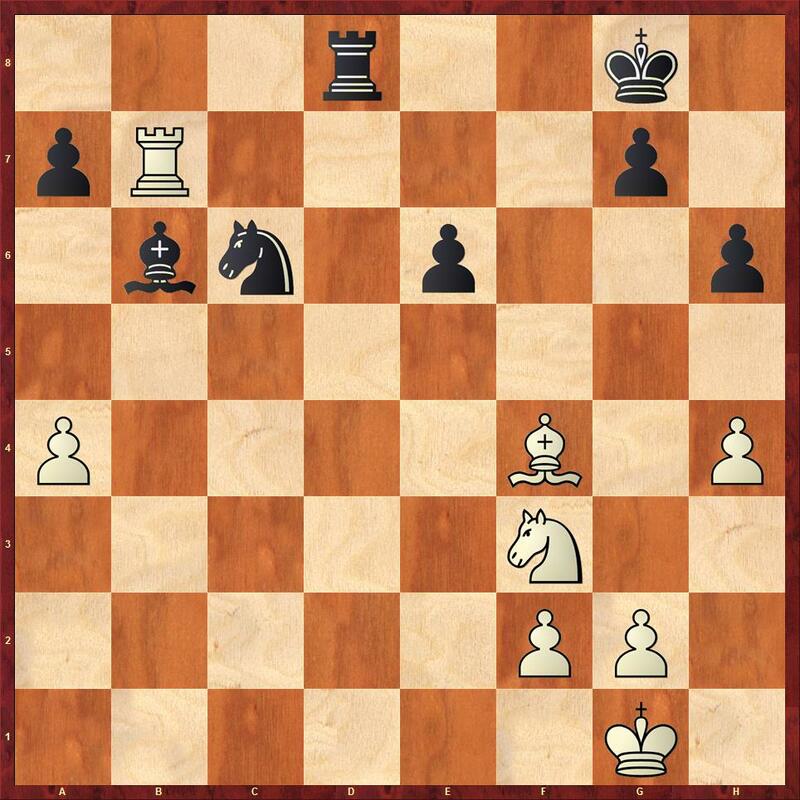 The second example is from the 1998 Kettler Cup, a Scheveningen match between the USA and the Czech Republic, ending as follows: Kavalek 3.5/4, Yasser Seirawan 2.5/4, Zbynek Hracek 1.5/4, Jan Smejkal 0.5/4. The position was reached from the sharp Perenyi Attack in the Sicilian Scheveningen. After a forced play white thought he can win the pawn f7 with a nice play for the piece. The only way to continue. Suddenly, the rook is trapped. White will get a pawn combo, forcing black to sacrifice the knight. But it will not be enough to save white's game. The worse way to give up the rook. After 25.Re7 Bxe7 26.fxe7 Nc6 27.f6 Kd7 28.Rd1+ Ke8 29.Ne4 Nxe7 30.fxe7 Kxe7 31.Rd5 Ke6 32.Rd6+ Kf5 black has more technical problems. The accurate move. After 26...Re8 27.Nd5! the tables have turned and white wins. The knight is not as flexible on d5 as on e4. Although 28.Rf1 Ke6 29.Ne4 h6 30.Nc5+ Kf7! seems better, it is still inadequate. The blockade is more important than the material. Black has coordinated his pieces successfully and soon wins the dangerous pawns. White resigned by move 59. The last fragment is from a friendly match between the Czech Republic and Cuba, played before the Chess Olympiad in 1964. My opponent, Rogelio Ortega, who looked like the legendary blues guitarist B.B. King, won the Cuban championship in 1966. 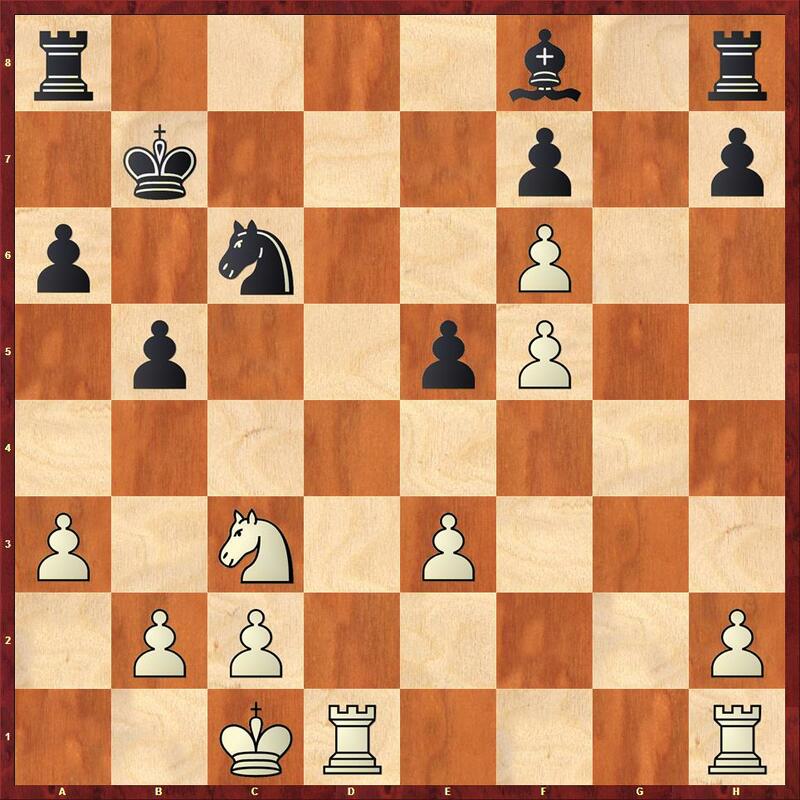 The position appeared in one variation from my game against Ortega. It looks like black is done, but there is a narrow, amazing way to save the game. The black queen is hanging and white has too many threats. The point! 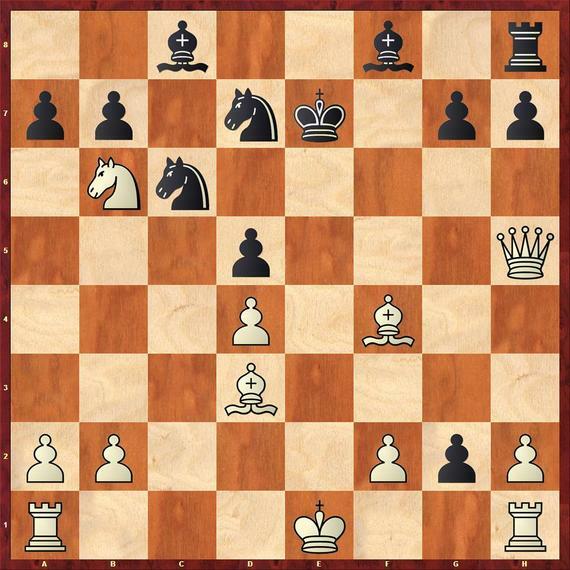 White wins the queen by force, but black has a hidden resource. After 17...Qxa1? 18.Nxd5+ black can only choose how to get mated: 18...Kd8 19.Bc7 mate, or 18...Ke6 19.Qf5 mate. Black has sufficient material for the queen after 18.Bd6+ Kd8! 19.Qf7 Nxd4+ 20.Kd2 Bxd6 21.Rxh1 axb6 22.Qxg7 Rf8. Forcing the black king to walk into a queen check. The only move. After 20...Kxc8 21.Rxh1 Nd8 22.Rc1+ white wins. The white queen is trapped. Another unexpected performance of the knight on d8. The chances are equal. 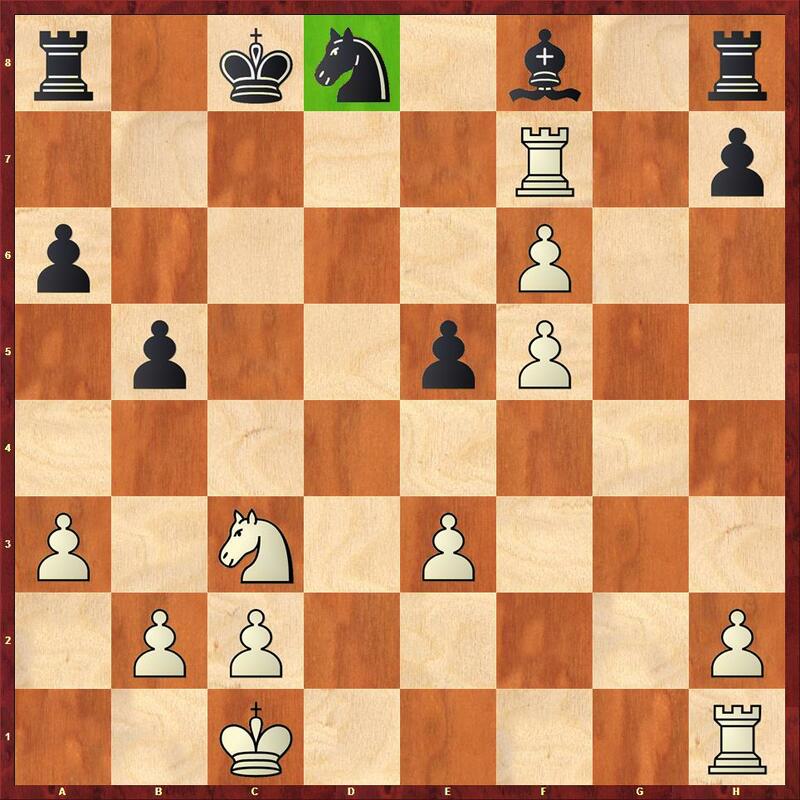 A different variation was played in the game and black won.